Orlando Attractions Update – Kids can discover even more Halloween fun at Legoland Florida Resort on select dates this October during Brick or Treat. 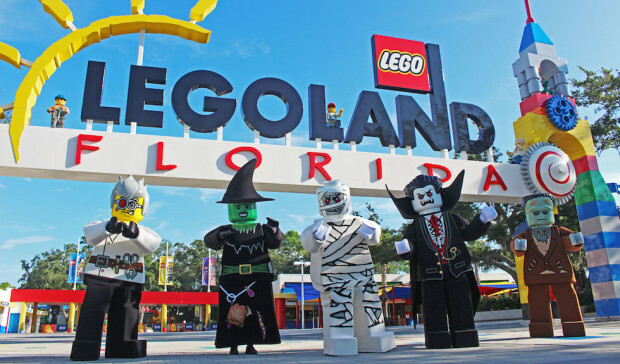 Offered every Saturday and Sunday in October, plus new Friday dates on Oct. 23 and 30, Brick or Treat features whimsical Halloween activities for kids throughout Legoland Florida theme park. Adding to the excitement this year are an exclusive fireworks show, meet-and-greet opportunities with new Lego Halloween characters and photo opportunities with an all-new, larger-than-life Lego model created exclusively for Brick or Treat. • Trick-or-treating along the Brick or Treat Trail for children 12 and under. Each event date will conclude with a pirate-themed fireworks show in the skies above Lake Eloise. Complimentary 3D glasses add a special Lego twist to the colorful spectacle. Guests at the brand-new Legoland Hotel can extend the fun with Halloween-inspired food and beverage offerings such as “mocktails” mixed just for kids. Plus, themed prizes await kids in each guestroom — locked in a Lego treasure chest that can only be opened during an in-room scavenger hunt. For more information about Legoland Florida Resort, visit Florida.Legoland.com.